Finding is the word used to describe all the components that you can use in making your jewelry designs. 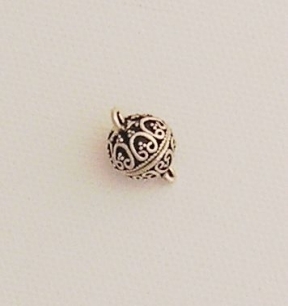 Findings are usually functional in nature, but they can also be focal design elements such as fancy, decorative bead caps or a unique clasp that is a major part of your design. 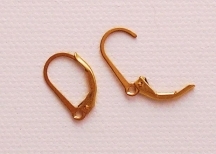 Findings include metal components such as head pins, eye pins, clasps, bead tips, bead caps, ear wires, hoops, jump and split rings, and more. There are more unique findings being produced all the time, and it is fun to shop at your favorite bead store to get fresh design ideas. Here are some common findings, but check your bead or craft store, or on-line supplier for even more findings! Also, be sure to check the Jewelry Supply page for more information and a great selection of supplies! Headpins are a staple in making earrings and in attaching dangling beads to bracelet and necklace designs, so make sure you always have plenty of these in stock. 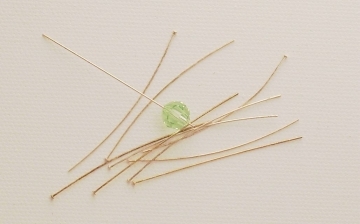 A head pin has a small head on one end that prevents the beads from slipping off. Head pins come in different lengths and wire thickness (also known as gauge). Use longer headpins if you are planning to use large beads or several beads to make up your design--you want to leave enough wire at the top to form a loop so you can attach it. TIP: The smaller the gauge number, the wider (fatter) the wire. I typically use 24 gauge headpins because the wire is thin enough to fit through most bead holes. If the head on the pin is too small for the larger diameter bead holes, and your bead slips off, just attach a small decorative bead on the end first, then slide your bead into place and it will rest on the smaller bead without falling off. Order head pins in bulk to save money! Need Head Pins? Click here to find some right now! 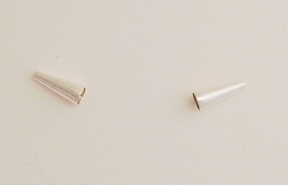 These are used the same way as head pins, but instead of a head they have a small loop on the end. You can attach dangles to the looped end. 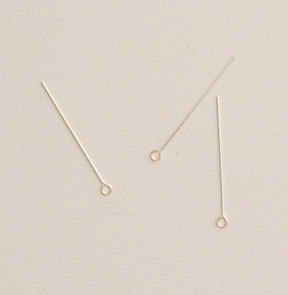 TIP: You can also make your own eye pins simply by using straight sterling silver or gold-filled wire. Just cut a length of wire and create a loop at one end with your pliers--and viola, instant eye pins! Need Eye Pins? Click here to find some right now! 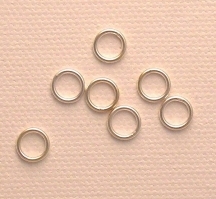 Jump rings come in several sizes, and they come soldered shut (solid ring), or with an opening (split). Choose the one that works best for your design. TIP: To open a jump ring, do not spread and pull the ends away from each other. This will warp the circular shape and you will find it difficult to reshape once you pull it apart this way. Instead, hold each side with a pair of pliers, and push each end away from the other sideways. This will create a small gap between the ends, but will retain the circular shape of the ring. Just push the two ends back towards each other with pliers to close the gap. Need Jump Rings? Click here to find some right now! Split rings look like miniature key rings. They have overlapping double wires, which you can pry apart to slide things onto. 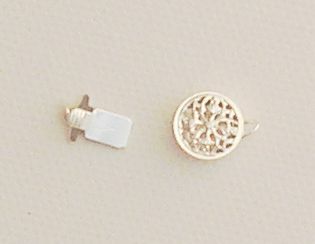 They are stronger than open jump rings because you can't pull the ends open, so they are useful in attaching charms and other dangles to your design. Need Split Rings? Click here to find some right now! TIP: If you plan to use a lot of split rings, it is a good idea to invest in a pair of split ring pliers. These will hold open the double wires of the ring making it easier for you to attach something. Otherwise, just like with an irritating key ring, you could find yourself splitting your fingernails and getting very aggravated! Clasps come in all shapes and sizes. Clasps are used to close necklace and bracelet designs. 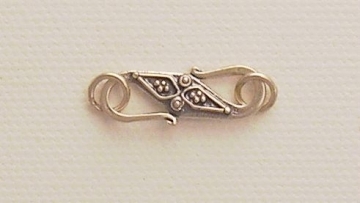 However, there are many highly decorative clasps that can also be used as an important design element. Some clasps are adorned with crystals, or inlaid gemstones. You can even make your own clasps by wrapping wire, or creating one-of-a-kind clasps with precious metal clay, or art clay. Be creative! Need Clasps? Click here to find some right now! The toggle bar fits through the toggle ring to close the clasp. These come in many wonderful shapes, sizes, and styles. 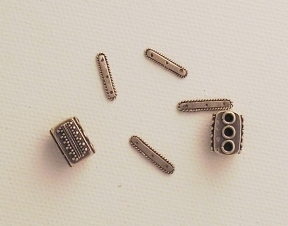 While a little more expensive than some of the other clasp styles, they are very popular and are often used as a key design element in bracelets or necklaces. You can close your necklace in the back, or leave the toggle clasp in the front if it is pretty. 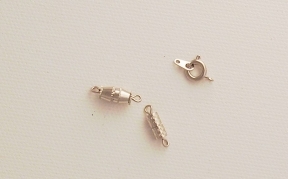 Need Toggle Clasps? Click here to find some right now! 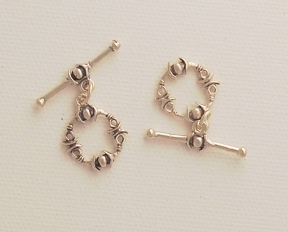 These are wonderfully easy to put on and off--two strong magnets are used to close the clasp. Magnetic clasps are usually smooth and streamlined in design, but they also now come in more decorative designs like the one below. Due to ease of use, they are great for people with arthritis. Need Toggle Clasps? Click here to find some right now! You've probably all seen and used the spring ring at some point. This is a circular clasp with a little lever that you slide back to open and close the clasp. These are typically inexpensive, yet secure claps. Need Clasps? Click here to find some right now! Much like the spring ring, you slide the lever back to open and close the clasp. These come in attractive elongated shapes, and some people find them easier to work than the rounder spring ring. Need Lobster Claw Clasps? Click here to find some right now! These come in a couple of styles, and you can even make your own with wire. Very easy to get on and off, you just slide the hook through a ring, an eye, or an extender chain on the other end. These often come in decorative designs and can be incorporated as a part of the design. However, because they slide off and on they are a little less secure than some of the other clasps. 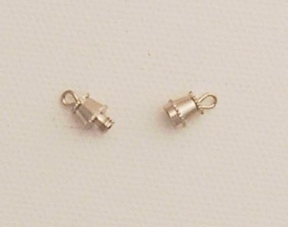 These clasps have two parts, and they simply screw together. These are typically inexpensive. Typically a decorative box, with a tab or snap used to close the clasp. These are usually delicate in appearance, often in filigree or another design, so they can be used as a key design element. They are typically more expensive than other clasps. These look great with pearl jewelry. 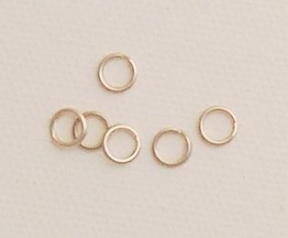 These have two or more holes used for multiple-strand jewelry designs. They can close in any number of ways, but basically they are used for designs that you want to keep from twisting. 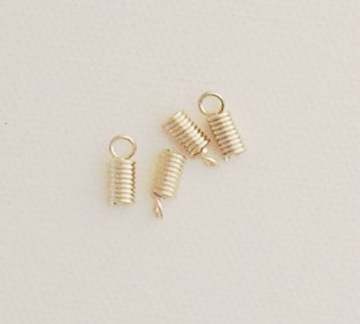 Ends are used to attach your stringing material to a clasp of your choice. Spring or tube cord ends are folded over or flattened down to attach leather, suede, or satin cord to your choice of clasp. For memory wire, glue end caps to each exposed end of the wire to hold the beads in place. These are the earring components that you will attach your beaded headpins and other design elements to, creating the finished jewelry. Obviously, choose the style and type that you (or your wearer) prefers. They come in pierced, clip-on, silver, gold, hook, chain, loop, post, and leverback. 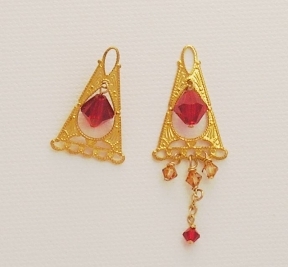 For heavier earring designs, consider leverback or posts, because wires might pull forward and slip out. 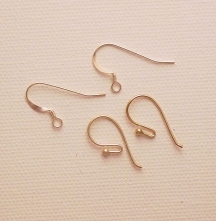 TIP: Create simple earrings in five minutes or less! Simply attach a favorite bead to a head pin, (with or without a decorative beadcap), and create a loop at the top of the headpin. Attach the loop to your earring component. Ta-dah!!! You just made earrings. Bead frames are design elements used to dress up your design. A bead frame has a hole in either end, and the center is an open frame. To use a bead frame, find a bead that fits nicely inside your frame. Place the bead in the frame with the holes lining up with the holes in the frame, then slide the wire through all of the holes in both the frame and the bead. Links are decorative components and very useful in creating interesting jewelry very quickly. 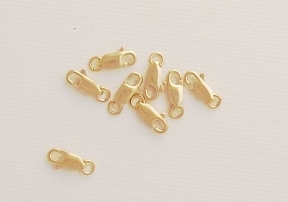 Use these to link components in a bracelet or necklace, or to create fast chandelier earrings and pendants. There are many decorative silver beads available. The most popular silver beads come from Bali, India, Thailand, and Israel. 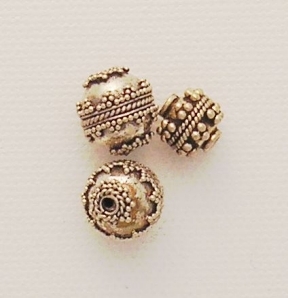 These beads are handmade and adorned with filigree, granulation, swirls and other designs. While they will add some cost to your design, these beads are definitely a design element and can make the difference between ordinary jewelry and jewelry with more pizzazz. Experiment with bead caps (a bead fits inside the cap), spacers, and other metal beads to add interest to your designs. Bead cone are typically used to finish the ends of multiple strand necklaces, and provide a more finished look. 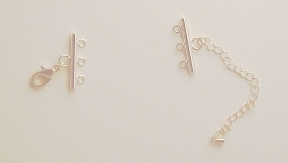 Spacer bars are used to separate multiple strands on a jewelry or necklace design. They can be decorative elements, as well. Be sure to check the Jewelry Supply page for more information and a great selection of supplies! This list is probably never going to be complete, as jewelry supply manufacturers are always coming out with fun new jewelry components. This is good news for us jewelry designers as we can always use some fresh inspiration to spark our creativity!